The notice sent in-world: Hi everyone (for one last time)! I was going to wait to send this notice in June, but now I'm not certain how June is going to play out exactly, so I wanted to make sure to give you guys plenty of time. For what, you say? As some of you may have guessed or even heard, I'm closing LAP for good in June. I won't be returning, or rebranding, I won't be listing on the marketplace, or any such thing - so this is it. There are no bad feelings or situations that are taking me away - it's actually a lot of good things in my RL that are going on and require more of my attention. Sometimes you just grow out of certain things and for me, creating in SL has become one of those things. 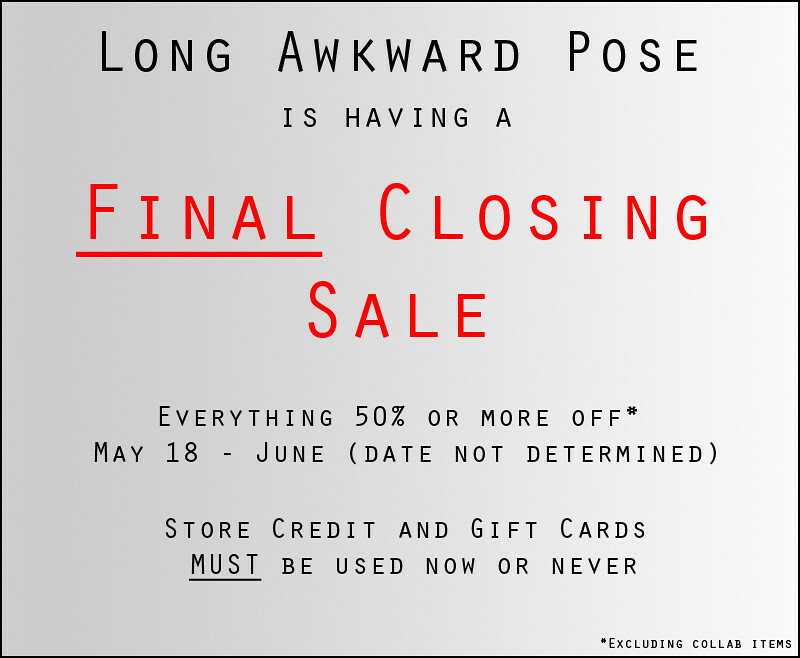 So, I'm having a final closing sale. Everything is going to be 50% (or more) off until it poofs forever in June. I don't have a firm date for June, so if you want something you should get it sooner rather than later. I've even brought back a couple of older items and reduced them as well. I won't bring back everything - some things are better left alone. Thank you so much to everyone who has been a supporter for all these years. I'm not "quitting SL" - I will still be around as a casual user and consumer, but as a creator I truly do have to thank you all for everything you've helped me accomplish. My shop has been open since 2007, this year is five years that you've helped me keep it going. I doubt many of you know but your support helped me support my family in RL, helped me to return to school, helped pay for medical costs, and pretty much changed the course of my life forever. I'll be forever grateful. I'm not sure what else needs to be said. I guess I'll go out the way I came in, with a long awkward ...pause. Warm wishes to you, and yours..